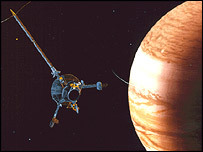 The Galileo space craft has been destroyed in the atmosphere of Jupiter. The US space agency probe was sent hurtling into the gas-giant at nearly 50 kilometres per second (108,000 mph) to avoid any chance of it contaminating local moons. The impact was timed to occur at 1857 GMT, although because of the vast distances involved it was not until 1943 GMT that the break in the probe's final transmission was picked up on Earth. "I'm just a little sad but Galileo has done a tremendous job for us, and it's a nice ending for it," Dr Claudia Alexander, the probe's project manager, said moments after the scheduled impact time. And Sean O'Keefe, the Nasa chief, added that Galileo had been a "truly phenomenal mission". "We managed to extract four times as much [information] as anybody ever reasonably expected to over the course of 14 years," he said. The destruction of the space craft brings to an end one of the most successful ever voyages of planetary exploration. The Nasa probe has returned a treasure trove of data. The space craft was named after 17th Century Italian astronomer Galileo Galilei, who discovered Jupiter's four main moons - Ganymede, Callisto, Io and Europa. The probe's launch from the space shuttle Atlantis in 1989 had been delayed by the Challenger disaster and there were several technical glitches along the way. In the end, though, it surpassed all expectations. Galileo travelled more than four and a half billion kilometres (nearly three billion miles). It circled Jupiter 34 times, sending back 14,000 pictures and other data over the course of seven years. "Galileo has provided a fantastic database that will be a rich source of progress in the planetary sciences for years or decades to come," said Fred Taylor, professor of physics at Oxford University, UK, who has worked on the mission for 30 years. "The mission has provided key information about Jupiter and its place in the Solar System." The mission team decided last year that Galileo should end its days in a blaze of glory. With the space craft almost out of fuel and power, Nasa did not want to risk it colliding with one of Jupiter's moons. There was a slim chance that a microbe from Earth could have hitched a ride on the probe. Of particular concern was the ice-crusted moon Europa, which, thanks to Galileo, scientists now suspect harbours a salty ocean beneath its surface and possibly microbial life. If the probe had crashed into Europa, this could have compromised future attempts to search for life there. Scientists were hoping that before Galileo impacted Jupiter, it would manage to transmit some final data on the giant planet's stormy atmosphere. It provided evidence to support the theory that Europa, Callisto and Ganymede all have sub-surface water. 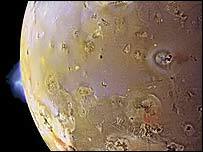 The probe sent back remarkable pictures of volcanic plumes on the moon Io. Galileo was the first space craft to drop a probe into the gas-giant's atmosphere. Galileo was the first spacecraft to fly by an asteroid and the first to discover a moon of an asteroid. "Galileo sent back precious data to the end"